The Korea Herald is publishing a series of articles highlighting South Korea’s promising startups in the emerging sectors of digital health care and next-generation medical devices. This is the 19th installment. - Ed. Whether we know it or not, we are heavily guided by our emotions when making decisions or forming an opinion. For instance, you might unconsciously choose to buy a particular facial cream after being exposed to the product in an advertisement that used background music that you liked. And it’s no surprise that consumer businesses go to great lengths to understand people’s emotions. They heavily invest in collecting concrete, scientific evidence to improve their marketing tactics, by analyzing facial expressions and voice responses or text-mining through customer surveys. But could technology help us better understand emotions? For South Korean tech startup Looxid Labs, the answer lies in virtual reality, a next-generation technology platform with new capabilities and potential. VR involves a person wearing a head-mounted display. By design, VR headsets directly touch the forehead and stay close to the eyes, and can therefore collect data from the wearer in ways that a fitness band or smartphone cannot. This includes biological cues like brain waves and gaze, both of which are heavily linked to how a person is responding to what he or she is seeing. And here, Looxid Labs founder and CEO Chae Yong-wook saw a lucrative business opportunity. Founded in 2015, the Seoul-based startup has developed what it claims is the world’s first mobile VR headset equipped with both eye-tracking and brainwave sensor technologies -- the emotion-tracking LooxidVR. The device comes in two forms -- as a standalone mobile VR headset to which a smartphone can be strapped, and an attachable accessory that works with existing VR headsets. Right now, the add-on is compatible with HTC’s Vive, with development underway for linkage to the Samsung Odyssey and Oculus Rift. How does it work? The LooxidVR headset fits comfortably on your head. Once worn, the device uses eye-tracking sensors to track eye movement and pupil size as you’re viewing a certain piece of content. Sensors touching your forehead track the brain waves coming from the frontal lobe. The biological signals that are picked up are analyzed via machine learning algorithms, to draw conclusions on what kind of emotions were felt. It presents a new form of analysis within the VR platform. For instance, a popular way to judge the effectiveness of an anti-smoking ad was through a post-viewing survey asking the viewer how they felt. But with LooxidVR and its analytic solutions, data such as a viewer’s stress level and gaze at certain parts of the ad can be tracked and analyzed. The device could observe that high-frequency brain waves associated with stress are peaking at a scene where a smoker is experiencing acute pain from years of smoking. This would tell companies, frame-by-frame, whether a message is working, or not working. 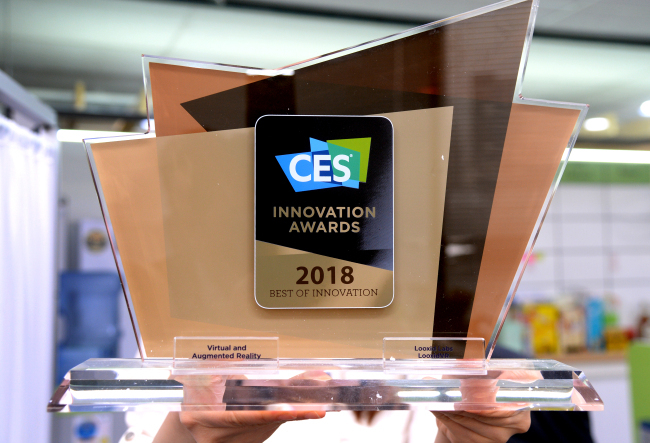 LooxidVR has already won international acclaim, taking home the Best of Innovation Award in Virtual Reality at CES 2018. It is set to formally start sales in Korea and abroad from August. So far, Looxid Labs has partnered with major Korean companies in the advertisement and auto industries as a strategic marketing tools provider. While LooxidVR is a useful solution for marketing optimization, the technology is also a good tool for improving mental training and education content made for VR platforms, Chae noted. According to the CEO, VR content is increasingly being used for psychological therapy -- for instance, as a relaxation tool for those in high-stress occupations or as a treatment option for conditions like ADHD. Education is also a big area, as students can learn by interacting with VR content. In this field, LooxidVR would help companies gauge the effectiveness of their content by providing objective, data-based feedback on how people are interacting with the VR materials, Chae explained. What Looxid Labs is doing is directly related to Chae’s expertise. The 36-year-old CEO holds a master’s degree in bio and brain engineering from KAIST with a specialty in brain-computing interface technology. His project at the university had involved developing sensors and algorithms that would enable robots to move in accordance with the brain waves of a human controller. While pursuing a Ph.D., Chae left his studies to co-found Ybrain, a health-tech startup that has built a headband that treats depression by stimulating the frontal lobe of the brain with a weak stream of electricity. With hopes of launching a product closer to his original field, Chae founded Looxid Labs. Over the next five years or so, Looxid Labs wants to successfully promote its “Emotive VR” technology to procure stable profits and collect big data on people’s biological cues to build better AI systems for emotion analysis. With the accumulated data and techniques, the startup hopes to eventually create an “emotive AI” that goes beyond replacing repetitive tasks for humans, but to understand human emotions on a personal level.